Cincinnati, Ohio : Writer's Digest Books, c2009. CREATIVE WRITING & CREATIVE WRITING GUIDES. How do widely published authors keep their stories burning hot? Readers learn how to supercharge every story with deep conviction and, conversely, turn fiery passion into an effective story. 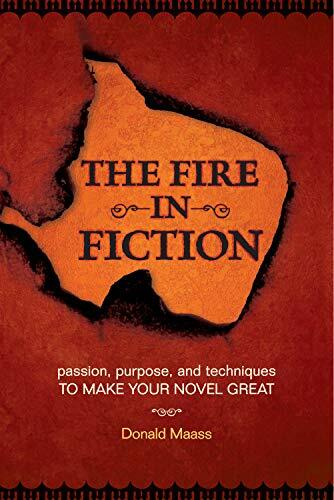 "The Fire in Fiction" shows not only how to write compelling stories filled with interesting settings and vivid characters, but how to do it over and over again. With examples drawn from current novels, this inspiring guide shows readers how to infuse writing with life. This book is a useful tool for writers. The examples were quite helpful. There is a lot to consider when trying to create a really good piece of writing. Lots of food for thought here. Excellent advice from someone who obviously knows what he's talking about. Very good examples. Wow. I've read a lot of books on writing. On building characters, on story structure, and on writing craft in general. The Fire in Fiction falls into the category of general craft, as it touches on many aspects of writing. It is one of the -- if not the -- best books on craft I have read. Maass's insight hits home every time, explanations are clear, examples further make his points, and by far the best, the exercises after each section are so immediately helpful I had stopped reading and started applying them to my WIP. I then decided to finish the book first, so now I'm going back to the exercises. They've already improved my manuscript! I found The Fire in Fiction to be helpful only in delineating things I've previously discovered and wished I'd known earlier. Perhaps it even has helped me hone in on the target in some areas I tend to slack off in and I would have loved to have read this five years ago before I did all the research that helped me see the targets the first time. What it is most insightful of is that it encompasses the mind of a literary agent and what this one likes and expects from his authors. And perhaps some bit of unintentional verification of something I have long suspected. They really do like purple prose as long as it is purple prose that helps develop the unique character that is integral to the story. There's a lot of it in these example that he critiques. That leads us to the problem that resides in the pages. This book is a serial compilation of critiques or reviews of what appear to be this authors favorite authors. And I would agree with others that it serves little purpose other than to pat the backs of these authors and fill the pages. Much of what is said here could be condensed and I would expect that to be the first thing that would be recognized by a literary agent when editing this whether it is self edited or otherwise. ( and it would be insane to self edit in this context). Something that would have been helpful is examples of what went wrong amidst all the what went right. And at least twice we were told certain things could not be covered here as they would take too much time and space which becomes ridiculous when one considers that 100 pages of this could have been eliminated by narrowing down all of the favorable reviews. The reason I gave this four stars is that it doesn't deserve five and I am taking enough out of it to rate it higher than three. I definitely recommend this to any author as a refresher on what works for some of this agents favorite writers. There is much to take away and I would also recommend it to the Forums and writers groups who always claim they are helping each other meet the requirements of an agent. This might help them focus a bit on the real as opposed to their preconceived notions. It's also engaging and entertaining despite the bloat of examples. Maybe I'm just easily pleased, but I loved this. Each chapter contains explanations for why different elements of fiction "work" -- that is, why characters, places, descriptions, and voice can all capture our attention and turn an otherwise ordinary story into a page-turner -- and practical exercises you can use when writing or revising.